Get ready to dig out your cow costumes or get creative with a white tee shirt and black markers! On Friday, July 13, 2012, Chick-Fil-A will be celebrating Cow Appreciation Day. 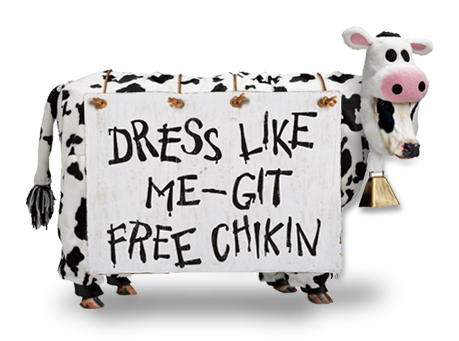 Lucky for you, you can score a FREE meal if you dress up like a cow. Kids can have fun creating their costumes as you get ready for the big day. Parents – if you are squeamish about wearing full costume, you can just wear a cow spotted hat, purse scarf or accessory and earn a FREE entree. (Must be in fullhead-to-toe costume to get a full meal) This is one event that is sure to get everyone into a good MOO-d! Go HERE for all of the details, ideas for costumes, downloadable masks and more!